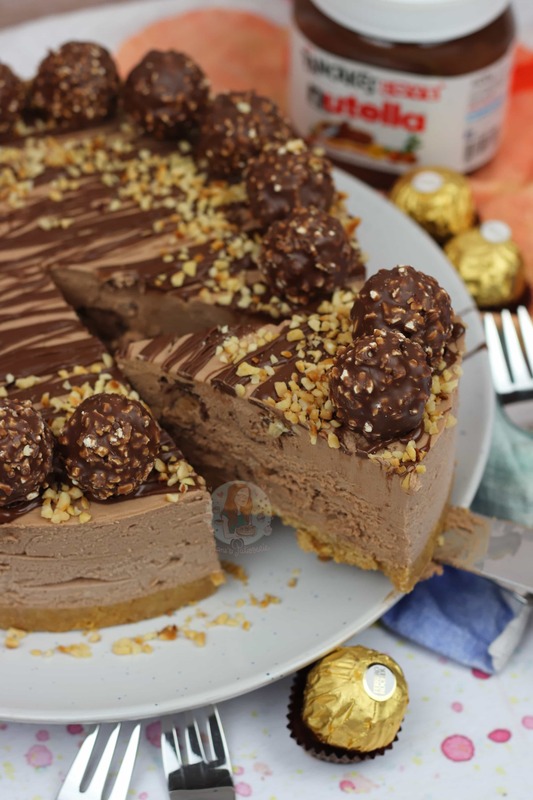 No-Bake Ferrero Rocher and Nutella Cheesecake! 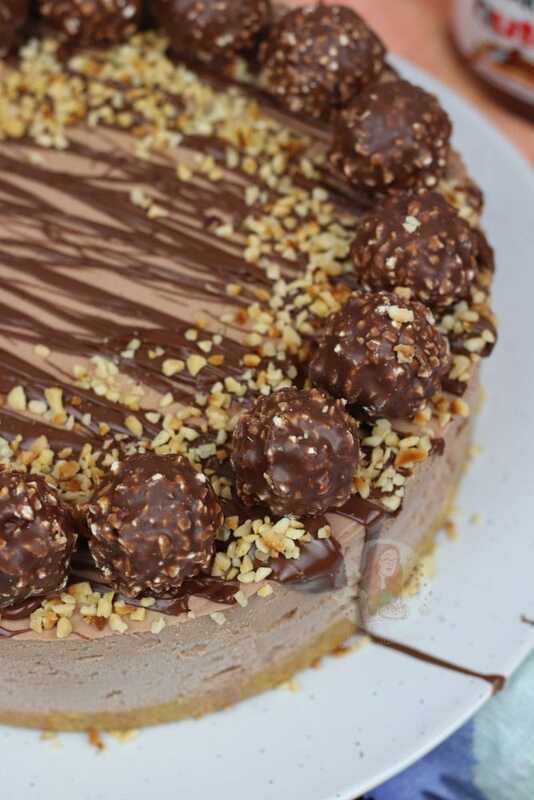 Delicious combination of two of the world’s favourite treats in a yummy delicious No-Bake Ferrero Rocher & Nutella Cheesecake! Heaven! So yeah, this heavenly little beauty happened. 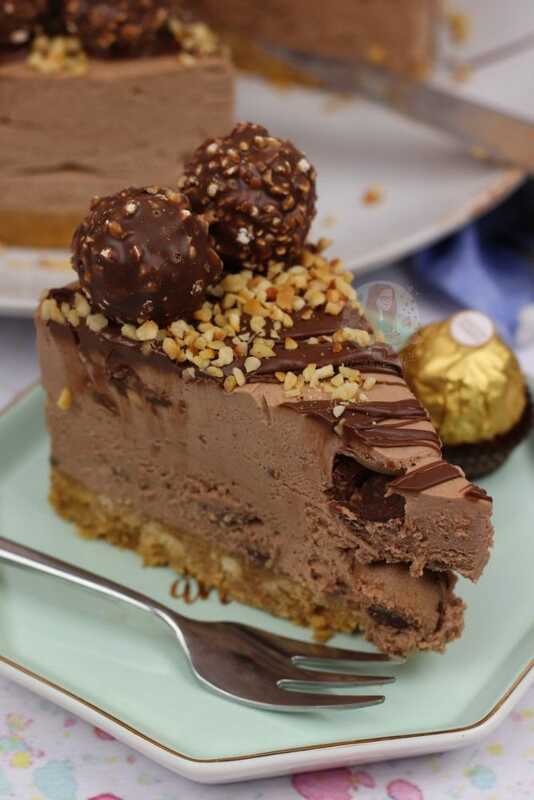 I reposted my recipe for my Ferrero Rocher & Nutella Chocolate Tart the other day on Facebook, and it had an overwhelming response again – everybody loves Ferrero Rocher and everybody loves Nutella! (Alright, I get that a lot don’t, but most do!) 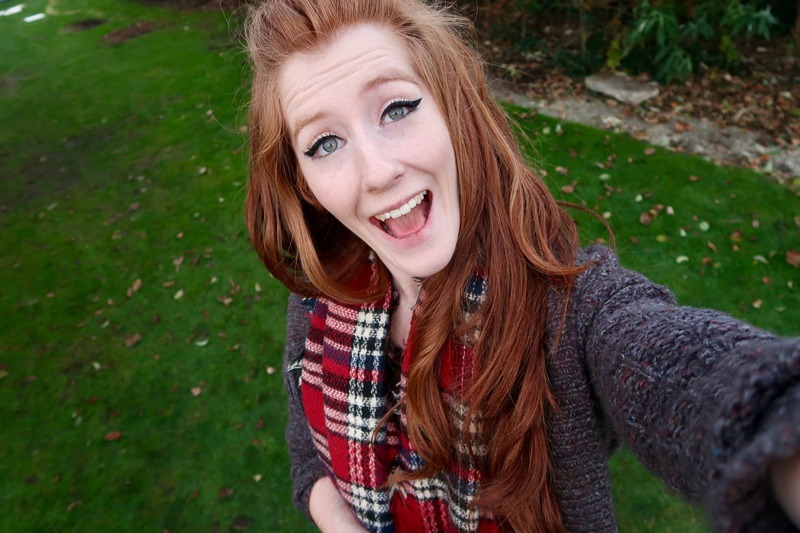 I was asked by TEN people – TEN! – to create this beauty so I had to comply! I was also tagged in a lot of photos of my Nutella & Ferrero Rocher Fudge recently which seems to be going down a treat – thank you! I know I post a lot of cheesecake recipes, but I still find that its useful to post them – rather just one recipe for them all. Sometimes I use more cream than others, more cream cheese than others etc! 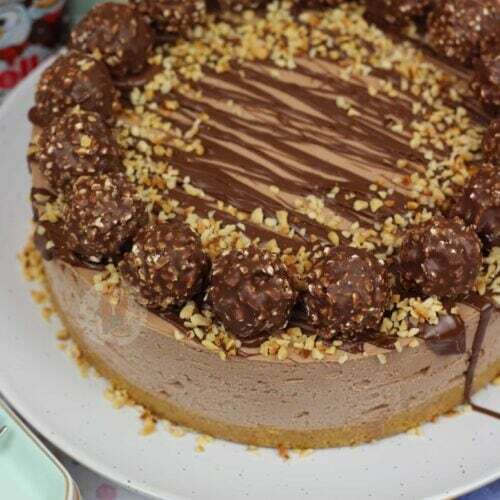 This recipe is delicious as you have the yummy creamy Nutella flavour with Ferrero Rocher dotted throughout the mixture giving texture and even more flavour! For this one, I decided to use Mascarpone personally, as I really wanted something sweet. Basically sweet overload, but I find the nuttiness gives it a delicious slightly savoury taste. Also, as I use regular digestives on the bottom, with no added sugar in the base, it’s relatively savoury in itself. You can, of course, change this, but you have been warned! You can use any FULL-FAT cream cheese you like in the filling, whether it be Philadelphia, supermarket own or anything. However, for this beauty, it’s definitely Mascarpone. This one does seem to take a smidge longer to whisk up in comparison to other cheesecakes, but that’s just the Nutella. Stick with it, and it’ll whisk up to a thick wonderful cheesecake eventually. For this, I decided to do my biscuit base as per usual, and then make one of the easiest cheesecake fillings there is. 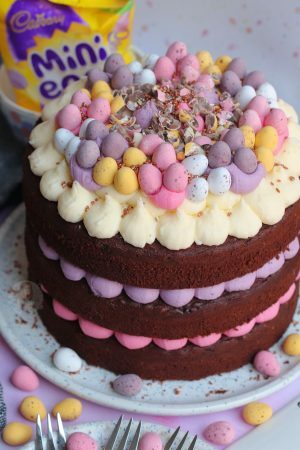 You basically have to add the Cream Cheese, Nutella, Icing Sugar and vanilla all together and whisk till smooth, then add in the double cream and whisk again. It really is oh so simple. I use a KitchenAid so I find this bit quite easy. When I’m whisking it, I don’t tend to go about level 6 on the speed, unless I know there isn’t a chance of it over whipping. I realise that not all of you have stand mixers, and it can be done with a handheld electric whisk, you just have to make sure that you concentrate so as not to over whisk it as well. Alternatively, you can whisk the double cream separately and then fold it all together, but I prefer the other method. At the end of the day, its what you feel comfortable with! If you are unsure whether it has set correctly, you can stick it in the freezer for a bit, to make sure it firms up enough to serve. I also realise that Ferrero Rocher isn’t the cheapest of things, but I tend to bulk buy when I find a good deal. The ones that you put into the actual cheesecake are optional, or the ones on top are optional. It’s really up to you! As you will have seen from my other cheesecake recipes, I like to be indulgent. You can swap to Kinder Bueno if you want to make it cheaper, or any of the Aldi/Lidl versions work amazingly too! 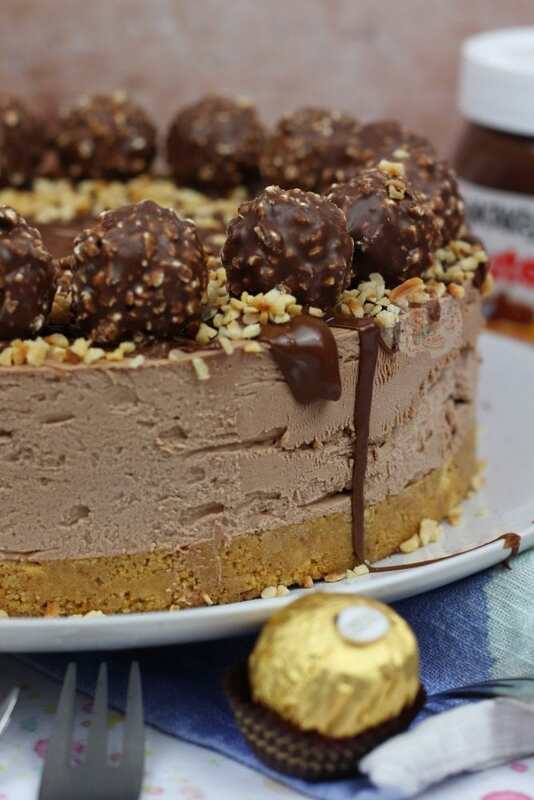 Ferrero Rocher & Nutella Cheesecake! 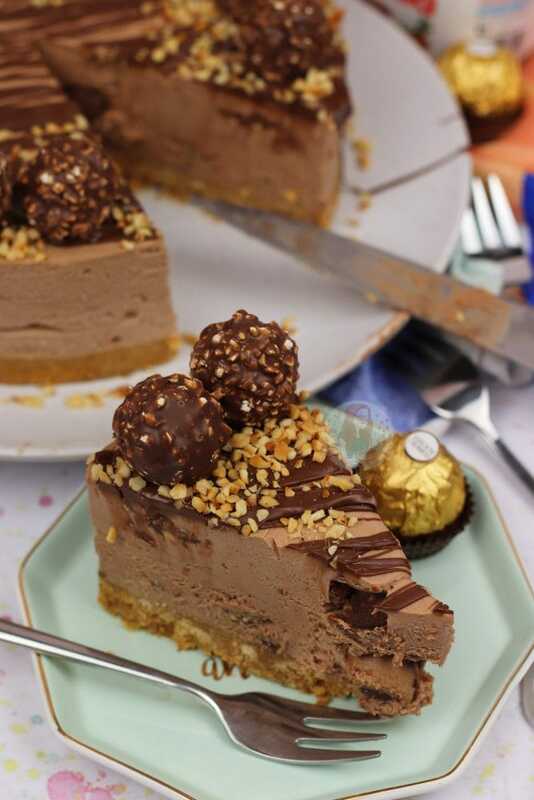 Delicious combination of two of the world's favourite treats in a yummy delicious No-Bake Ferrero Rocher & Nutella Cheesecake! Heaven! Blitz the biscuits in a food processor (or crush in a bag with a rolling pin!) and mix with the melted butter. Press down into an 8″/20cm Deep Springform Tin – refrigerate for now. Pour in the double cream and whisk on a medium level (my KitchenAid was on level 6) until its thick and holds itself completely! You will know when its done as it won’t thicken any more! It's better for it to be under whipped rather than over whipped so don’t over whip it! 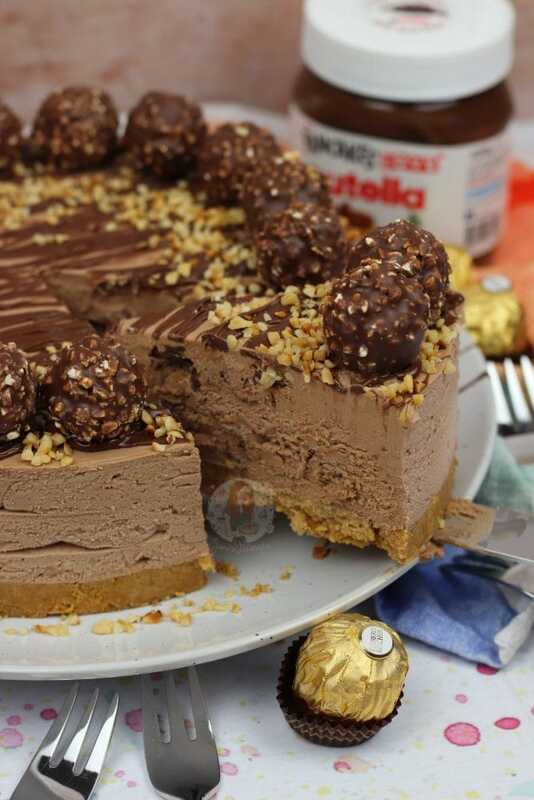 Fold through the chopped up Ferrero Rocher and spread the mixture evenly over the biscuit base. Chill in the fridge for at least 5-6 hours, but preferably overnight. Once chilled, remove from the fridge and decorate. I drizzled over some melted Nutella, added on some more Ferrero Rocher in a ring, and sprinkled on some chopped hazelnuts! I LOVE Nutella – like so so much – but I get that it isn’t to everybody’s taste – If you’re not a fan, then try a different sort of spread that you rather such as Cadburys Chocolate Spread, or any other Nutty Spread! I also understand the Ferrero Rocher is expensive, so Kinder Bueno will also do! I always use my KitchenAid to make my cheesecake filling. If using an electric hand-held whisk then try not to use too high a setting as this might cause it to over whip and go all icky! So take your time, it will be smooth and hold itself when the mix is ready! This recipe was updated November 2018 - the only difference is the decoration. You can find my other Cheesecake Recipes on my Recipes Page! Older Next post: Carrot Cake! Newer Previous post: Salted Caramel Nut Slice! I’ve just realised I have bought Philadelphia instead of marscapone. Will it make much of a difference to the taste / texture? Thank you. It will be slightly tarter, and not as sweet, but it should work the same as long as it’s full fat! Love all your recipes especially the cheesecake ones. A raffaello cheesecake recipe is long overdue! That would be so yum! 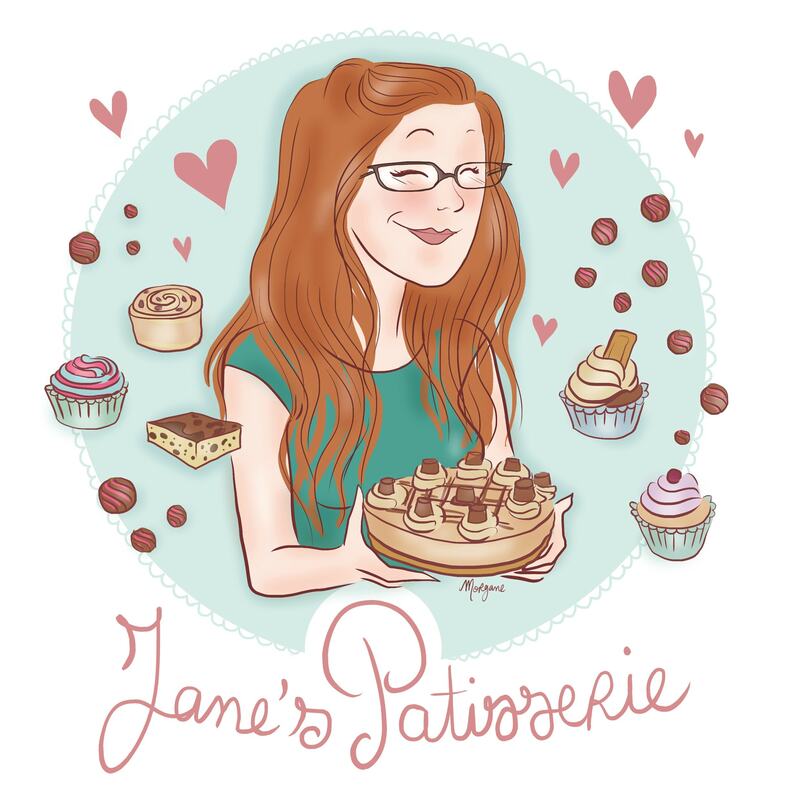 Hi Jane, thank you so much for sharing this! I tried this for my sisters baby shower but it didn’t set overnight. I used an electric whisk and think I whisked it enough. It was in the fridge for 20 hours but still didn’t set. Any tips? The taste was fabulous though! Love your recipes, can’t wait to try more. Hi jane I just wanted to ask if you had the original recipe of this? I had it saved but lost a few things on my phone. My family loved that one as they don’t have a massive sweet tooth and although they enjoyed this one they said it was a little too sweet for them. Thank you!! Hey Jane can I please just ask a question. Do you still have the original recipe? It had less nutella and icing I believe. I did save it but lost a lot of things on my phone. My family don’t have a major sweet tooth but loved that recipe. I made this one and they said inwas really nice but a little too sweet for them and preferred the original. Thank you! Hi! I just tried this one out. But why doesnt mine get thick? I think ive done everything right but when i add the cream and whisk, it doesnt get thick enough? Was the mixture still smooth? It sounds like it just needed a welly of whipping! Just made this now and just popped it in the fridge for dessert tomorrow after Christmas dinner. The cheesecake filling doesn’t look as thick as your other recipes are (I’ve made quite a few of your recipes before) hoping that’ll it set decent over night. But was wondering… is it usual for it to look less thick as it’s got the nutella spread in it? 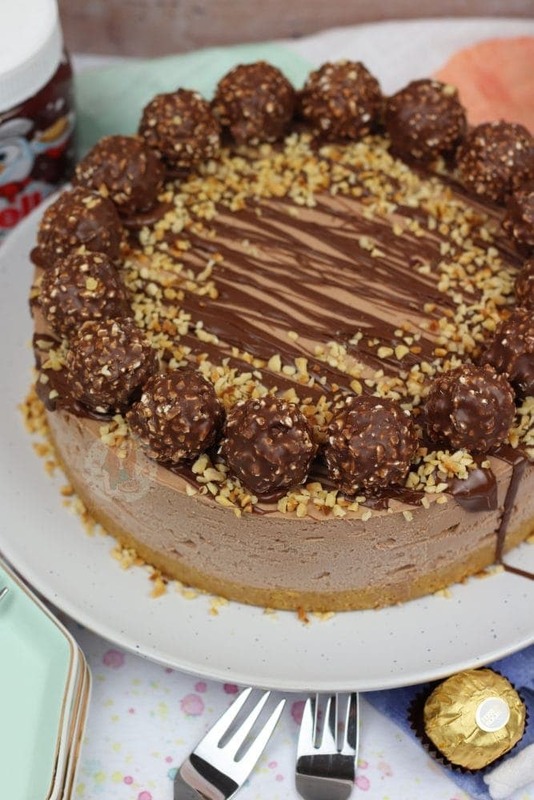 I’m going to make this for Christmas Day, but think I will omit the Ferrero Rocher from the cheesecake mixture just in case it does go a bit soggy. I can’t wait to try it! Do you think it will make much difference if I leave the Ferrero Rocher out of the mixture and just put them on the top? Nooo that will be fine! Enjoy! Hiya – the bounty spread is runnier and thinner than the rest, so thats why thats the only altered one. Love this cheesecake, its become a family favourite. I make it on special occasions as it’s a bit pricey. 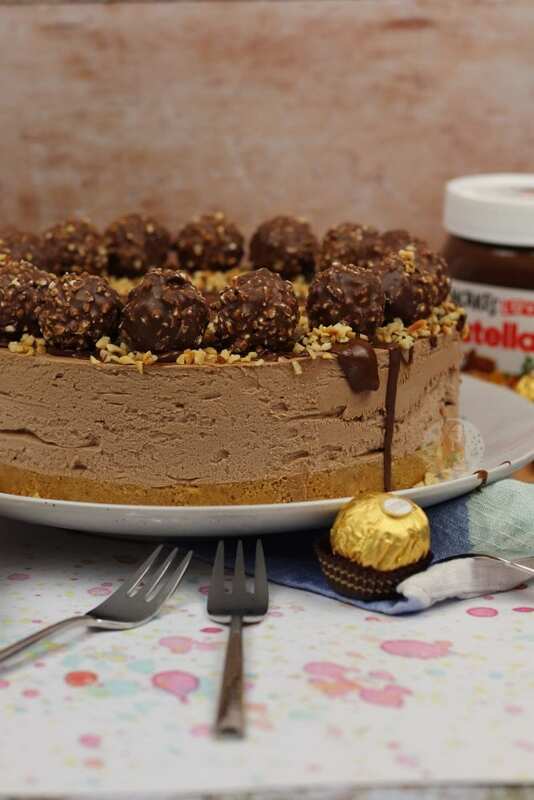 Have you ever found that the ferrero in the cheese cake has got soggy? The wafer bit in it. Mine did, I don’t if it’s something iv done or it does happen ? That is something that can happen, but it doesn’t matter. It’s there for the taste. No, sorry. It’s a side effect of it. Again as I say, its just for flavour more than anything. 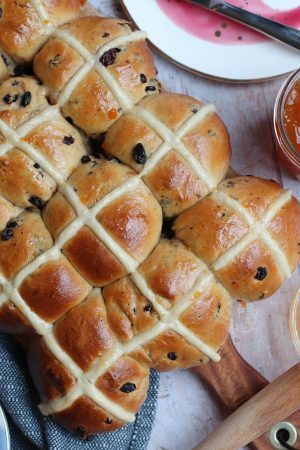 I’ve just made this for Christmas Day lunch as well as your pavalova recipe, Made it yesterday so chilled overnight and looks like it hasn’t set ?So going to stick in freezer for ice cream cheesecake! Would you set in freezer for a couple or hours then take in say 30 mins before serving ? Thanks ? How about using some gelatine to settle it down? Yes you can! I simply don’t as I don’t need to, and many of my friends are vegetarian so can’t eat it. This looks so yummy, I could faint! I have recently discovered you and I think your recipes are absolutely amazing so well done and thank you! I am having my first dinner party with my boyfriends friends this weekend and this cheesecake looks to be a winner! I have attempted cheesecakes before and for some reason I can never get my biscuit base to be buttery and crumbly. It either goes soggy or so firm you almost break your teeth ha ha! Just wondering if leaving cheesecake overnight is best option (to have following evening) or best to make that morning and set for 8 hours? Will this affect the base? That looks unreal!!!! I love it! Be still, my beating heart! Ferrero Rocher is my favourite and this is my idea of a healthy meal! This looks amazing! I just whipped up Nutella brownies last week. Will have to save this for when my next craving hits. Wow! This cake looks magical. Well done, Jane! 🙂 I was also wondering if you’ve ever baked a peach cobbler before? If so, would you be able to direct me to your post about it, please? I got a bunch of peaches the other day and have always wanted to try my hand at a cobbler. 🙂 Thank you! 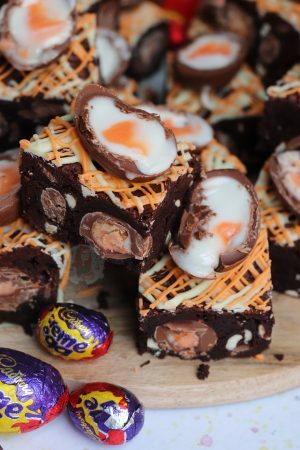 Another yummy recipe Jane – I’m sure mom will love it as she loves ferrero rocher! Ladies…I believe in cake for breakfast too! Intelligent women unite! ?? ?